Michael Hodgson has forged a relentless path in the music world since his early days as Tinnitus, a music & performance art project with Angus McNaughton and Ashley Turner in Christchurch in the 80's, and then as The Projector Mix, an industrial dub project in Auckland in the 90's. The latter led to him meeting Paddy Free and forming Pitch Black, since when they have released 5 albums and toured the world many times. Not personally interested in making popular music or following trends, Michael is happiest on the edges, subverting conventional musical structures and echo systems. Misled Convoy has become the vehicle for exploration outside of the constraints of his more populist collaborations. The first Misled Convoy release was a live album recorded at Beautiful Music, Auckland in 1999 (available for free download from https://bit.ly/2LvRXqx) and was followed by remixes of acts from around the world, including NZ's own The Adults, London pop punks Feral Five and ambient dub pioneer Banco de Gaia. Living on opposite sides of the planet since 2012, Pitch Black's last hiatus gave Hodgson the chance to finally record "Tickling the Dragon's Tail" in 2014. Hailed as "stunning" by Louder than War, it was expectedly dark and dubby, but was also surprisingly groovy in parts with plenty of ambience and noise in there too. The bonus track alone was over an hour long and sounded like a microphone melting in a fire. 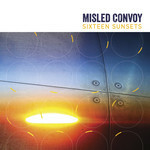 Now Misled Convoy is back with the sublime new album "Sixteen Sunsets", alive with sonic ideas and influenced by the multitude of sounds he's gathered as he travels the world. 'Found sounds' recorded in Iceland, Sweden, Turkey, Italy, Croatia, Spain, Greece, England and Austria have been woven together into delicate yet sophisticated pastiches, layered and twisted with beats and melody, leaving the listener to sense the world around. The cicadas of a Greek island, the automated voice of a Stockholm bus, the sounds of rubber on cobblestones at a Roman roundabout, the unusual chug of a narrowboat on a London canal - all are drenched in effects and underpinned with Hodgson's signature dub and bass. Trails of sound are how Hodgson's music making often begins. After finding a Russian language vowel sounds 7" box set in a charity store, Hodgson researched which nations had sent astronauts to the International Space Station (ISS). The 7'' became the vocal bed for the title track "Sixteen Sunsets", which was then augmented with vowel sounds from the other nations who have also inhabited the ISS. The title is inspired by the phenomenon that, every day, due to orbiting the Earth every 90 minutes, the residents of the ISS witness 16 sunrises and 16 sunsets.